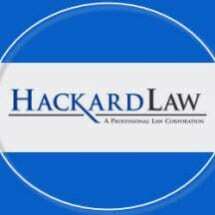 At the Sacramento office of Hackard Law A Professional Law Corporation, we understand the significant nature of the legal issues that our clients face and the amount of trust they put in us to protect their interests. In fact, outside of the doctor-patient relationship, we can't think of another business relationship that revolves around such important matters and requires such an enormous investment of faith. Our attorneys and support team take this responsibility seriously. The legal matters that we work on with our clients — estate planning, probate, elder law, business and civil litigation, personal injury, and more — involve some of the most important decisions that will be made during an individual's or business' life. We bring a passion for personal care and professionalism to each client that is difficult for other law firms to match. Our experience — attorney Michael A. Hackard, alone, has represented clients throughout Greater Sacramento and beyond since 1976 — serves us well in our goal to resolve our clients' legal needs efficiently and cost-effectively. To use a sports vernacular, we have a deep bench. All of our lawyers share Michael's commitment to creativity, compassion and producing positive results. Because our team embraces a consultative approach, when you hire one of us, you get all of us. We welcome the opportunity to answer any questions you have regarding a legal problem during a free consultation. If you face important estate planning decisions, suffered injuries in a car accident caused by someone else, or you are dealing with business litigation matters, we can review the facts of your case, provide a candid assessment and recommend the best course of action. We represent individuals, families and businesses well beyond Sacramento County, including clients in Santa Rosa, Napa, Walnut Creek, Vacaville, Fairfield and throughout Northern California. Call 916-229-6991 to schedule an appointment today. Million-Dollar Advocates Forum, Avvo 10 Rating: "Superb"